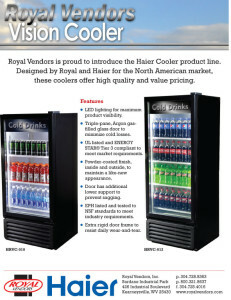 Haier – Vision Cooler — Royal Vendors, Inc. LED lighting for maximum product visibility. Triple-pane, Argon gas-filled glass door to minimize cold losses. UL listed and ENERGY STAR Tier 3 compliant to meet market requirements. Powder-coated finish, inside and outside, to maintain a like-new appearance. Door has additional lower support to prevent sagging. EPH listed and tested to NSF standards to meet industry requirements. Extra rigid door frame to resist daily wear-and-tear.